November 27, 2018 By Jason McEwen & filed under Bowling Articles. Like drummers in a band, left handed bowlers often find themselves the punch line of many jokes. Put this one in the win column lefties, this article is for you! Instruction for bowling is generally geared toward right-handed bowlers with a caveat that the left-handed bowler should just reverse what is being said. In many ways this isn’t even possible. For example, the pocket for lefties is the one and two pin and double wood is the three and nine pin. These are simple examples, but they speak volumes to the often overlooked left-handed bowler. Another misconception about left-handed bowling is that lefties don’t have to make adjustments like right-handed bowlers do. Lefties hear things like, “It must be nice to have the whole side to yourself.” This implies that because there aren’t as many lefties, the shot is easier. It also implies that what right-handed bowlers are doing to the lane some how has no effect on the left handed bowler. Both are false. Right-handed bowlers move farther and farther left on the approach in today’s game, and their laydown point on the lane is now infringing on the left-handers shot. From the 10-minute practice session to the last game in your event, the bowling ball is always changing the placement of the oil on the lane. It’s imperative to make adjustments no matter what hand you bowl with. 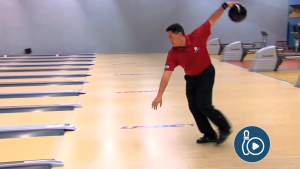 Right-handed bowlers make bigger moves on the approach and where they are targeting down lane. Left-handed bowlers find themselves making smaller moves using hand position and ball speed to better match up with what’s going on out there. Spare shooting is difficult for any bowler. If you shoot your spares with a hook as a left-handed bowler, the game just got a little more difficult. Because of all of the action from the right side, the oil on the middle of the lane is wildly unpredictable. Your best bet is to switch to a plastic ball and straighten out the shot. This takes away any variables the lane has to offer and your make percentage increases. Fine tuning an arsenal for any bowler is a life long commitment. For lefties, it comes down to making the bowling ball have the desired backend reaction when you need it most. This boils down to surface, pin placement and hand position upon release. Because lefties do not make big moves with their feet on the lane for their strike shot, it’s crucial to have the right ball with the right surface at the right time to score big. Let’s face it; winning teams more often than not have a left-handed bowler or two somewhere on the roster. So right-handers, if you don’t want to get left out of the winner’s circle, maybe it’s time to ease up on your left-handed friends. If you want to see instruction specifically geared to left-handed bowling, check out theseLeft-Handed Bowling Tips and Strategies. My ball layouts for sports pstterns. My suggestions for you regarding cores and layouts for sport bowling patterns would be to try and keep things as simple as possible, and then adjust surface on the bowling balls to match up reaction. With your amount of axis tilt and rotation I would recommend having both a pin up and pin down solid reactive ball, with a low RG core (2.47-2.48 or so) and a medium differential (.040-.050) to start with. This will give you a few options that will give you a nice smooth read of the lane. From there I would add in a solid asymmetrical ball, with a pin up layout. This will be good if the lanes transition in a way that you need to open up the lane more, and let the ball cover more boards as the asymmetrical core will tend to be stronger and will rev up quicker letting you cover more boards when needed. I would then also recommend a symmetric ball with a pearl coverstock, for when the lanes start to hook more and break down. Something again with a medium differential (around .040) and then a medium RG (around 2.50), with a smooth pin down layout. These four balls and layouts should give you plenty of options to tackle most sport patterns that you’ll see, and remember to adjust the surfaces to match up to your exact needs as well. Righties have a tendency to act like it’s easier for lefties including my husband. A few years ago, actually exactly two years ago in 2016 I was a right handed bowler, I had just got my first (and only) 800 bowling right handed the end of November of 2016. I developed tendonitis in my right thumb the end of December (look up “blackberry thumb”) and I had to make the hard reality that I was indeed going to have to switch hands at least for a while. Having never thrown more than 2 balls Left handed balls the reality was this was not going to be an easy task. Taking it step by step (fortunately went to a Ritger bowling camp summer of 2016) and a used metered plan on how to accomplish some sort of goal left handed, the challenge of learning everything again was going to be interesting. So it has been almost 2 years and 6 balls drilled as a lefty let me be the first to tell you I am not sure I ever want to go back. Every now and then I will pick up one of my old Right handed balls and give it a roll, After a year I bowled my first complete game right handed about a month ago and got a high 190’s game, so it is still there and can still do it, because 30 years bowing is definately easier with a dominant hand. After bowling 3-4 times a week for almost 2 years, there are 3 official left handed 700’s in the bag, and an average around the upper 190’s. And unofficially a 297. As a left handed bowler I am always hearing how much of an advantage I have over everyone if this were the case then all of the left hand pros would dominate all of the earnings and records for our sport. I would like to see more articles and videos for Lefty’s on layouts and adjustments. I have never seen 8 lefty players on same pare of lanes at same time, There are enough lefty players that it could happen. How about two lefty hand two lefty two hand players on the same pair of lanes. Who decides the players for the lanes? The lanes on left side would worn out very soon. Thank you for your patience. In regards to your question. In tournament play, players are selected at random for the lanes at which they play on. You did not unswer? Has there ever been a competition made only for lefties. Thanks for your patience. I’m sorry about not answering your question earlier. I have never heard of an all left handed tournament.